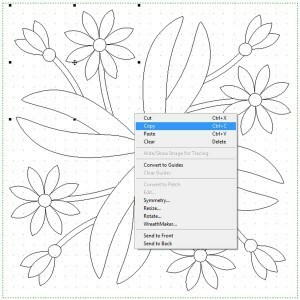 If you already have Quiltmaker Quilting Designs then you know that you can print any of the Quiltmaker stencils in any size. But what you may not know is that if you had EQ7 as well you can link the Quilting Designs volumes to your EQ7 libraries and use them in your quilt designs in EQ7. One better, you can actually edit any of the stencils in EQ7 to make them your own. It’s really easy and a great tool for those quilts you just can’t find the perfect stencil for. For example, this Dresden quilt needs some dressing up but the open spaces for quilting make it a tricky quilt to choose designs for. So let’s edit a nearly perfect stencil to make it just right! Before you get started you’ll need to link your Quilting Designs volumes to your EQ7. 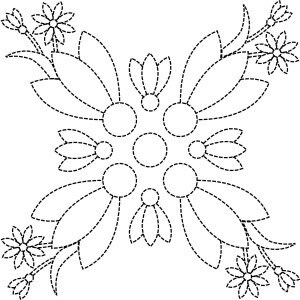 These instructions are in your EQ manual and also in the Quilting Designs package. Step 1: Edit your Dresden quilt to the Quilt Worktable. Step 2: Click on Libraries > Block Libraries. Step 3: In the left column scroll down until you see the Quiltmaker Volume libraries. 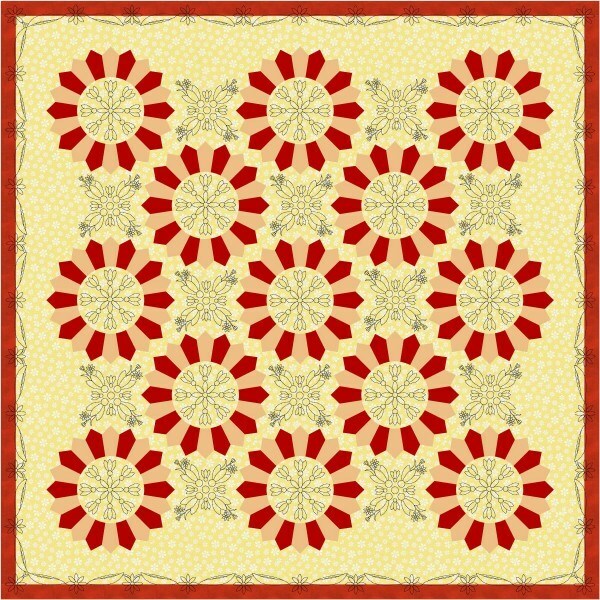 For this example, the designs you will see come from Quilting Designs Volume 5. If you do not have volume 5 you can use any designs you’d like. 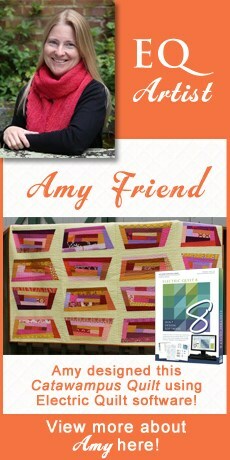 Click on the Quilting Designs Volume 5, then click on Quilting Designs Volume 5 again to expand the categories. Step 5: Once you’ve added these blocks close the block library. Step 6: On your Quilt Worktable, click on Layer 3. Layer 3 is where you place quilting stencils. Step 7: Click the Set Block tool to display the block palette. Step 8: Click the Stencils tab. Step 9: Find Daisy Chain Variation 3 and click and hold to select it, drag and drop the stencil anywhere on the quilt top and release. Step 10: Click the Adjust tool . Step 11: Click on the stencil to select it. Step 12: In the precision bar change the size of the stencil to 4.5 x 4.5. Step 13: Move the stencil to the middle of one of the Dresden plates. Step 14: With the stencil still selected, click CTRL + C to copy the stencil. Step 15: Click CTRL + V to paste a copy of the stencil. Move that stencil to the center of another Dresden plate. Repeat until all the Dresden plates are filled with this stencil. Step 16: Click Add to Sketchbook . Step 17: Click Work on Block . Step 18: Click View Sketchbook. 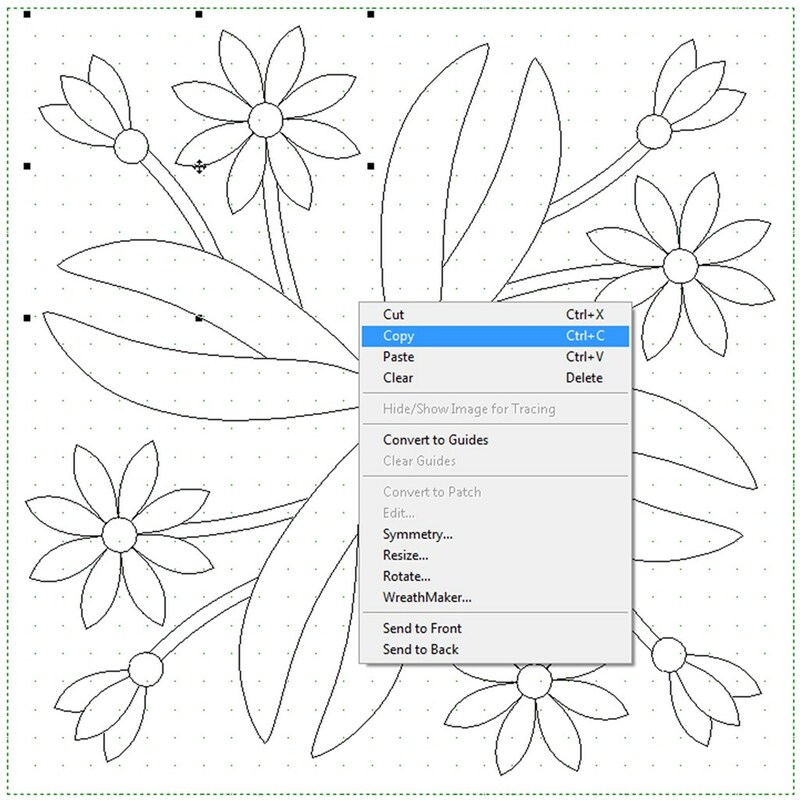 Step 19: Click the Blocks section and then click the Stencils tab to view your quilting stencils. 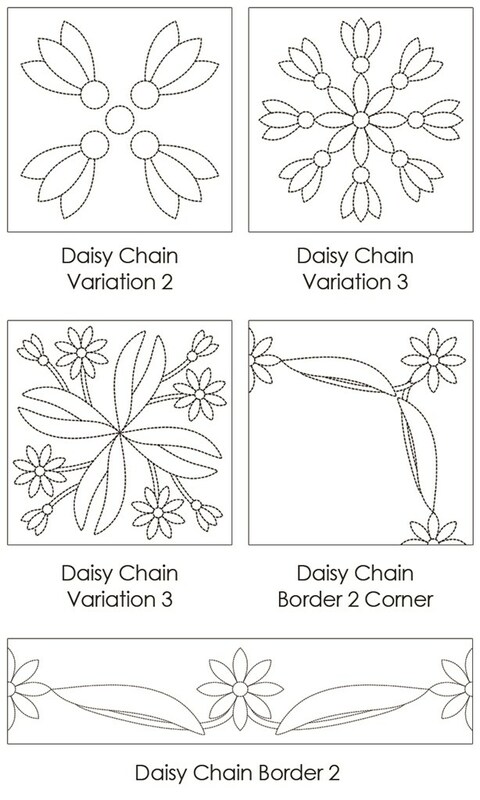 Step 20: Find Daisy Chain Variation 4, click to select it and then click Edit. 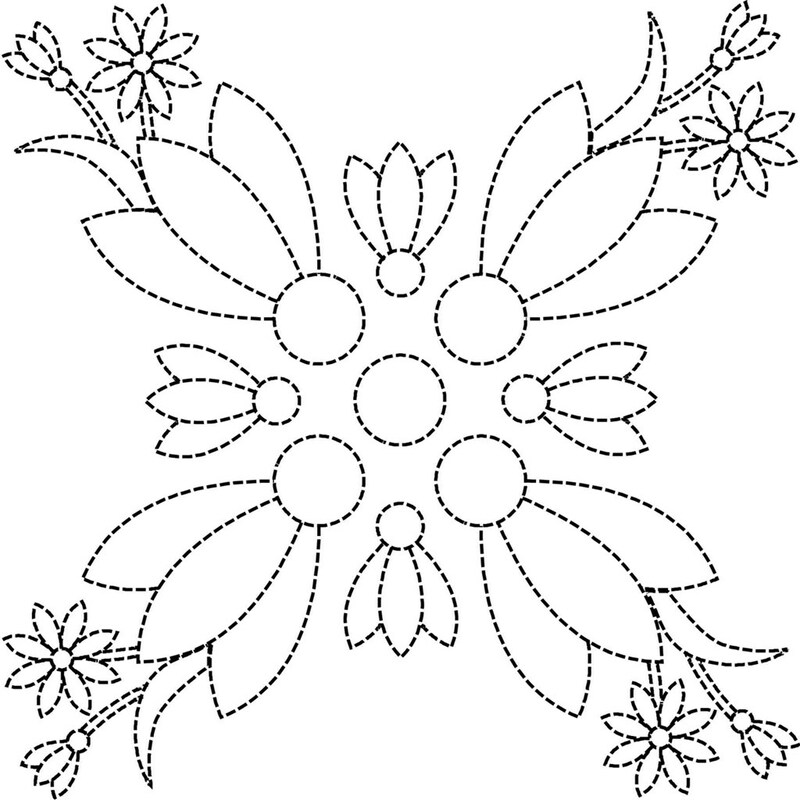 Step 21: Using the Pick tool, click and drag a box around the two small daisies and one leaf in the top left corner. With your segment selected, right click and choose Copy. Step 22: Click View Sketchbook and click on the Stencils tab. Step 23: Find the Daisy Chain Variation 2 and click Edit. Step 24: Click CTRL + A to select the entire stencil. Right click and choose resize. Change the size to 90 and 90 and click OK. Step 25:Click CTRL + V to paste the segment from the previous stencil. Step 26: With the pasted segment still selected, right click on it and choose Resize. In the Resize box change the numbers to 50 and 50. Click OK. 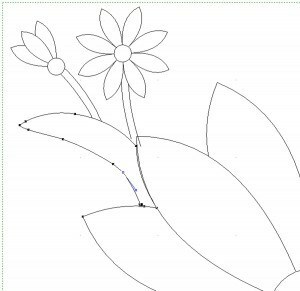 Step 27: Move the segment to the top left corner of the worktable so that the daisies are close to, but not touching, the edges. 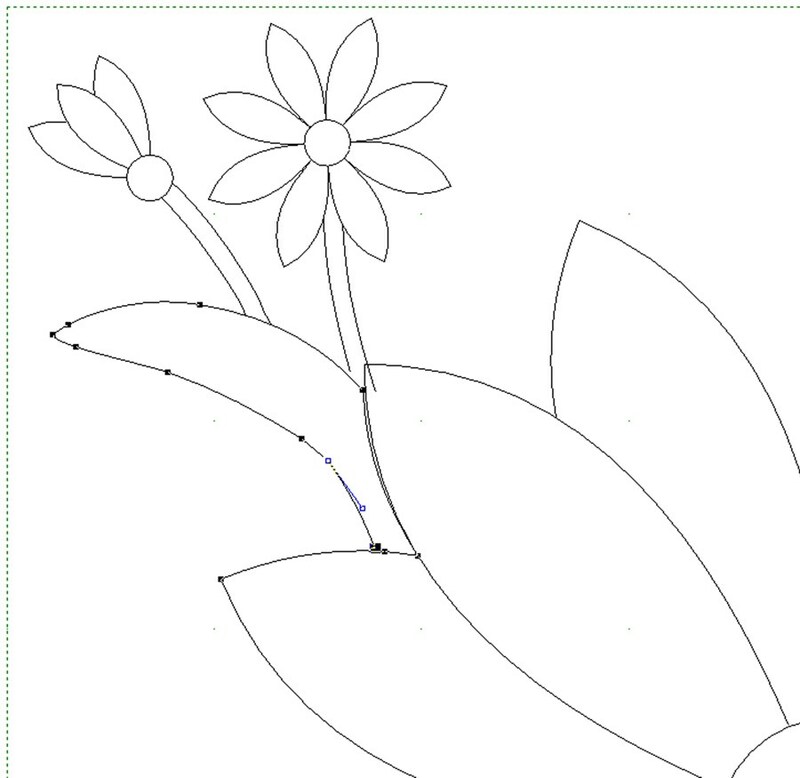 Step 28: Using the Shape tool, adjust the end lines of the leaf so that they do not overlap the stencil beneath it. Step 29: Using the Pick tool drag a box around the new stencil segment, right click and choose Copy. Step 30: Click CTRL + V to paste the segment. Step 31: With the segment still selected, right click and choose Rotate. Rotate the image 90 degrees and move it to the top right corner of the design. Repeat this for all four corners. Step 32: Using the Pick tool drag a box around the large, main flower buds. Right click and choose Copy. Then Paste. Step 33: With the new segment selected, right click and rotate the image 45 degrees. Again, right click and this time Resize the image to 50. Move the segment to sit between the larger buds and closer to the center as seen below. You should then Copy that new segment, Paste, and Rotate as needed to match the image you see below. Step 34: Click Add to Sketchbook. You’ve just edited 2 stencils together and created a whole new design. Now this design is a much better shape for filling the space between the Dresden plates on our quilt. The extended corners and dipped centers help to disguise the edges of the blocks in the quilt. Step 35: Go to the Quilt Worktable, click Layer 3, and click on the Set block tool. Because we’ve edited the stencil you will now find your new design under the Motifs tab. Step 36: Click to select the new design and drag onto your quilt. Step 37: Click the Adjust tool then select the stencil. Step 38: In the precision bad change the numbers to 4.5 x 4.5. Place the design between the Dresden Plates. Copy and Paste the design and fill all the spaces between the Dresden blocks. Step 39: Click Add to Sketchbook. 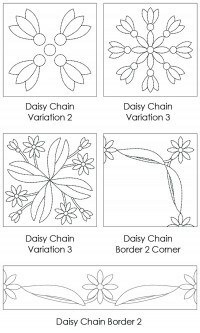 To finish off the quilt, use Daisy Chain Border 2 and Daisy Chain Border 2 Corner to create a boarder around the edge of the quilt. Remember to click Add to Sketchbook to save your work when you are finished, then save the project and Voila!